Playing god has never been a particularly strange ambition for Silicon Valley. Even so, there are few verticals filled with more utopian dreams than the studios and startups building virtual and augmented reality experiences. While some are looking to craft 3D experiences that integrate into the real world, others are aiming to create massive worlds we can escape to. The one thing many of them have in common, however, is that they are built on a game engine from a company called Unity. Unity Technologies, which builds tools for developers crafting 3D content across multiple platforms, has been having a pretty solid year. Earlier this week, the company announced that it has closed a massive $400 million investment from Silver Lake Partners that, according to a report in the WSJ, valued the company at $2.8 billion. This raise comes hot on the heels of a $181 million investment just 10 months prior. “Unity could be one of the most important technology companies in the next decade,” said Barry Schuler, a partner at DFJ Growth, which led Unity’s last round. Schuler’s biases should be apparent, but his belief — that if virtual and augmented reality manage to take off, then Unity will be poised for greatness — is one shared by many investors and industry insiders I’ve chatted with. The world Unity is ripe for is one based on spatial computing, a term for technologies that enable our interactions with digital objects to grow much more in line with how we interact with real-world things. Shopping for clothes online might transform from scrolling on a handheld device to peering at a real-world mirror and seeing what a hat or shirt would look like mapped in 3D on your head. It’s a world that’s limitless in its potential, though it will likely rely on some groundbreaking hardware to enable it as well as powerful software suites known as game engines. Game engines may have initially been built for video game titles, but the needs of several other major industries are beginning to line up and shape the ambitions of the companies like Unity that create them. Riccitiello joined Unity in 2014 as CEO, taking the reigns of the company from co-founder David Helgason who started the company from the ashes of a faltering game studio in Copenhagen. 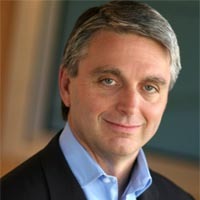 Prior to joining, Riccitiello served as CEO of Electronic Arts, one of the world’s largest video game companies. When Unity launched it was just another game engine — its breakthrough moment came when it was first to launch development support for the iPhone, bringing a host of developers into the world of iOS in its earliest days. A decade later, the company has around 1,400 employees and its software powers more than half of all new mobile gaming titles. The SF-based company may already have a healthy grasp on mobile, with competitors like Epic Games and their Unreal engine focusing more heavily on desktop gaming, but an area where Unity is increasingly focusing its efforts is in the AR/VR space. More than two-thirds of all content created for AR and VR uses Unity’s engine. Ninety-one percent of applications on emerging AR platforms like the Microsoft HoloLens are created on the engine, while Samsung’s Gear VR has about 90 percent of its gaming titles built using Unity. While AR and VR technologies are incredibly young, the companies fighting for dominance over the platforms are the ones that have loomed large for quite a while. Google has its Daydream platform for mobile VR and its Tango platform for mobile AR. Facebook just introduced its augmented reality platform at its most recent F8 developer conference and also owns Oculus, which makes high-end VR headsets. Later this year, Microsoft will bring Windows Holographic support to VR headsets, and the company has done extensive work on its augmented reality HoloLens headset. Schuler believes that Unity will only benefit from these companies continuing to duke it out for control, due to the engine’s widespread support for different platforms that users can publish to simultaneously with the click of a few check boxes. The company’s tools are free for personal use and priced on a per-device subscription for larger customers that scales based on the revenues being brought in. Riccitiello wasn’t too verbose on the topic of an exit, but said going public would be a topic of conversation for the future. “There will be another day when we talk about IPOs, but certainly not now,” he said. Unity’s simplicity may be one of its greatest selling points, but as the engine matures in its ambitions, so too does the risk of compromising its core mission, Riccitiello says. “The tension within Unity is always how to deliver this performance that would otherwise yield more and more complexity, and do so really simply. It’s always a vexing problem and a problem with balance,” Riccitiello said. Below is an example of one of Unity’s Adam demo, highlighting some of the engine’s more intensive, boundary-pushing capabilities at work.